If you want to be the coolest cat in the party scene this year then you need the purrfect accessories to add to your costume. Dress up in a fun 50’s or 60’s style outfit and you’ll be ready to give everyone a trip to the past at any Halloween party. Once you complete your outfit with the perfect threads, just add this pair of Vintage Cat Eye Glasses and it will look as if you walked right off the set of Mad Men. You’ll look like the sassiest gal at any party when you strut your stuff with these retro glasses. 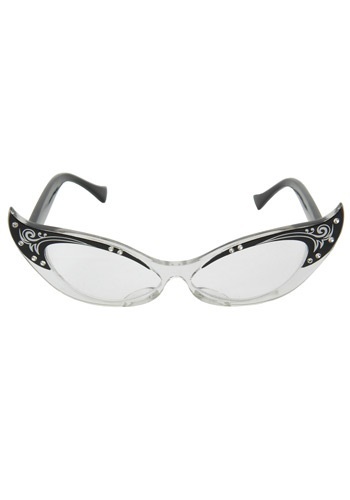 If anyone decides to give you trouble, you can simply pull these cat eye glasses down the brim of your nose and give them that dead-eyed stare you’ve been perfecting all these years. These glasses will add a whole new level of intimidation and whoever is giving you trouble will quietly leave. So grab your own pair today and take a look at the rest of our vintage accessories to complete your new retro look!